That's so good! You've got talent! I love your horse drawing! I absolutely could NOT draw a horse's head let alone a full horse! You have done really well. You did such an amazing job! I probably couldn't do better if I practiced for a year. Wow! So pretty! You got skills and you need to make a drawing book because you are the best artist I've ever seen! Wow! This is so incredible! Super awesome and amazing and very realistic. Good job! Wow! That's awesome! I can't draw like that! Wow, that is really great drawing! This is amazing and I love it to pieces. I have never seen anything better. Wow that is awesome! when I draw one it turns out to be looking like a dog or a pig! That is so good!!!!!! better than I can do! That drawing is amazing. You can with a real talent and with a pencil and paper. Great for you. Keep it up with your amazing hand. i think you should have drawn the horse standing equally on the floor or you should just have drawn a hill under her. but it looks fab i would love to be able to draw like that. what is it trying to do fall backwards? good luck. That is really good. you have a wonderful gift. I could never be that talented!! You call that quick sketch? That is amazing! Super drawing!!!! !I wish I could draw like that. 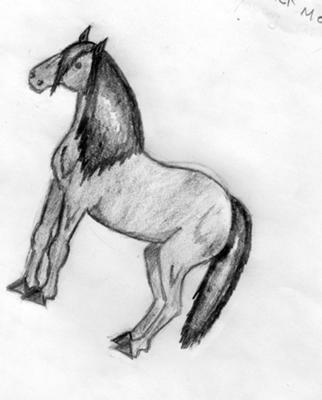 I can draw horses but not as good as you. You have a awesome talent!!! it looks so realistic. i thought i was good at drawing, but yours is way better than anything i would be able to draw. wow that looks so realistic! i wish i could draw like that. i just don't know how you do it so well, i will never be as good as that. your great! it's awesome. ya got some cool talent. Wow! I thought I could draw well but that is amazing. well done. it is so cool! wish i could draw like that perfect drawing. I can't believe it. you call that a quick sketch. i call it a masterpiece. can you teach me how to draw like that. You call that a quick sketch while I start going around showing everyone what I like to call a beautiful work of art! cool picture, i can draw horses too. the title says it all!!!!!!!!!! Oh my gosh that drawing is amazing! I wish I could draw like that! it looks like it took you a while to draw that. very impressive. Wow this picture is great... where did u learn to draw like that? Love it! I kinda wish you could look at the drawing while your writing your comment. It's really nice! For a quick sketch I am impressed. you are such a great horse drawer, well done ! OMG!!!!!!!!!!!!!!!! YOU'RE THE BEST DRAWER IN THE WHOLE WORLD! THE COOLEST! Its really good! I enjoy drawing horses but I'm not really good like you. wow!!! thanks for sharing it with us!